Pawley's Island, located in Greenville, NC, they have been making outdoor hammocks and furniture for over 100 years. They produce outdoor recycled HDPE Poly Durawood furniture that is backed with a lifetime residential warranty. Amish Craftsman, are well known for building high quality furniture and their Amish Poly Lumber furniture is no exception. They offer an extensive collection of exceptional products at a competitive prices. Malibu Outdoor Living, located in North Kingstown, RI has over 40 years of experience manufacturing. TheirHigh Density Polyethylene (HDPE) Poly Lumber outdoor furniture is made from the highest quality plastic lumber available and uses 316 stainless steel as fastners. They offer a 20 year residential warranty and a 7 year commercial warranty on all their furniture. 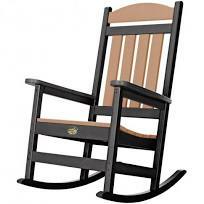 This Poly Lumber Adirondack rocking chair is very sturdy as well as comfortable. Features include a contoured seat and back as well as a rolled front. All screws and bolts are stainless steel. This rocker is built for the outside but pretty enough for the inside. 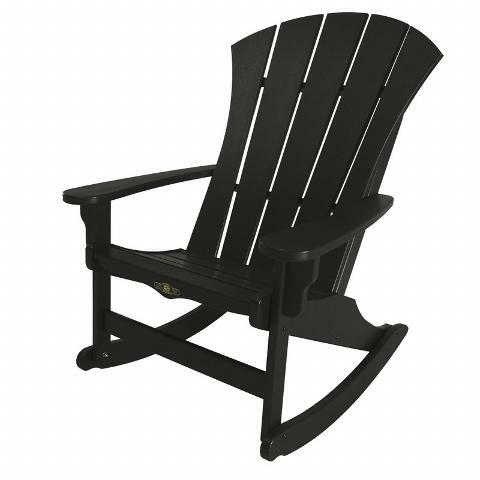 Seat depth 19" Seat width 22"
Width outside arm to outside arm 29.5"
This rocker has all the essentials that you look for in an Adirondack rocker, a high slanted back, a comfortable seat and classic good looks. Made with marine-grade 316 stainless steel hardware that is designed to resist rust, corrosion and withstand extreme temperature. Lifetime residential warranty. Seat depth 18" Seat width 22 1/4"
Outside arm to outside arm 30 1/4"
This Poly Porch rocker is available in 15 exciting HDPE colors. Uses paint tipped marine-grade 316 stainless steel hardware that is designed to resist rust, corrosion and withstand extreme temperature. Lifetime residential warranty. 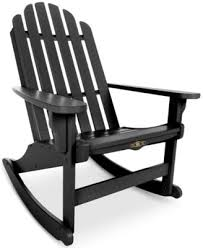 A beautifully designed as well as distinctly handsome Poly Durawood Adirondack rocker. The flaring back design was inspired by the frequent sunburst patterned wooden dock gates along Pawleys Creek marshes. The Sunrise has a contoured back that is high enough to rest your head back on as well as a comfortable contoured seat. Made to last using marine-grade 316 stainless steel hardware. Lifetime residential warranty. 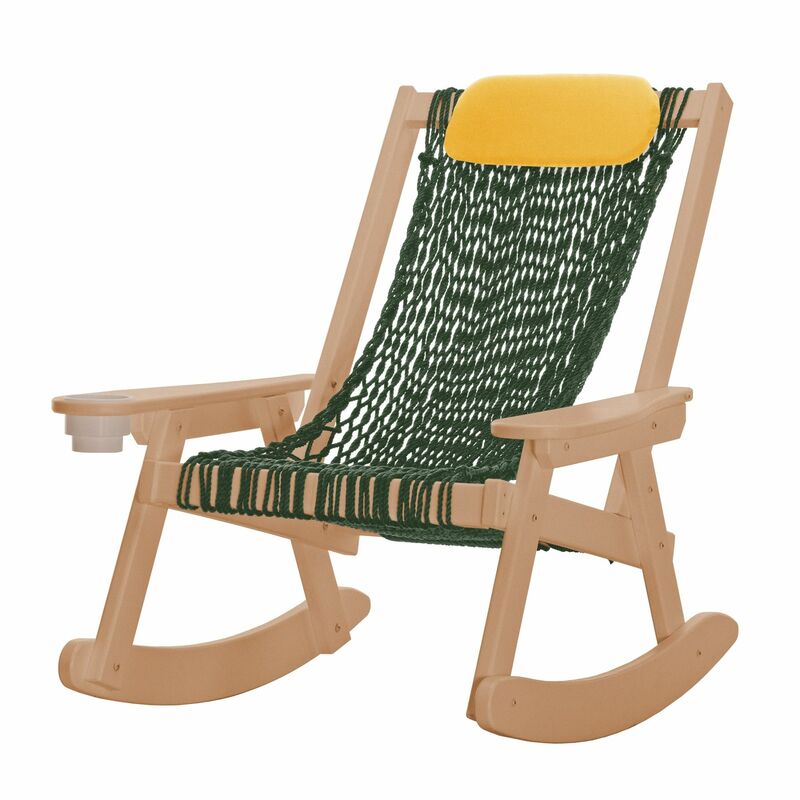 Seat depth 18" Seat width 22 1/2"
Width outside arm to outside arm 30 3/4"
This Poly rocker is for all you rope hammock fans. Frames available in white, cedar and weatherwood HDPE Poly with eight different DuraCord 3-ply rope colors. Paint tipped marine-grade 316 stainless steel hardware that is designed to resist rust, corrosion and withstand extreme temperature. Right arm is equipped with built in cup holder. 1 year residential warranty.